A close up of the Washington Aqueduct tunnels in downtown Washington. Note they pass straight through the White House. “As Above, So Below. As Within, So Without.”There are miles of old abandoned water tunnels directly under a lot of Alefantis’s properties of interest. The picture above is of workmen in one of the tunnels circa 1900s. First off there is a bit of background on the tunnels then there’s a map outlining all the properties of interest in relation to the tunnel network. I’ve also included examples of some of the tunnels discovered. Built in 1864 by Montgomery Meigs and the Army Corps of Engineers. 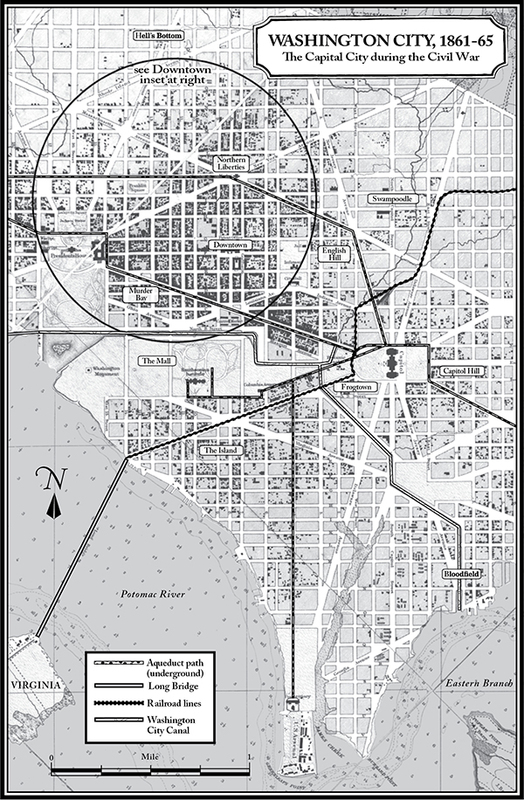 The Washington Aqueduct forms the central node in DC’s water infrastructure. Water splits into a set of parallel conduits and is gravity fed 9 miles from Great Falls, Maryland to Dalecarlia Reservoir. 1864 | Reference | OriginalPrecast conduit segments for the Washington Aqueduct. Water continues under Reservoir Road near Georgetown Reservoir and Glover Archibald Park. The aqueduct crosses Rock Creek Valley inside the Pennsylvania Avenue Bridge structurally supported by two 48-inch (122cm) arching water pipes. The conduits then begin to branch out in a network of smaller and smaller pipes that eventually connect with individual houses. Note that just before the aqueduct crosses Rock Creek it branches off left into Georgetown. 1864 | ReferenceA close up of the Washington Aqueduct tunnels in downtown Washington. Note they pass straight through the White House. The conduit is the largest structure of the water system. It stretches almost 12 miles downriver from the intake at Great Falls to the Georgetown Reservoir. The circular tube, built of brick, stone and mortar, is 9 feet in diameter. It was constructed by tunneling and by deep rock cuts. 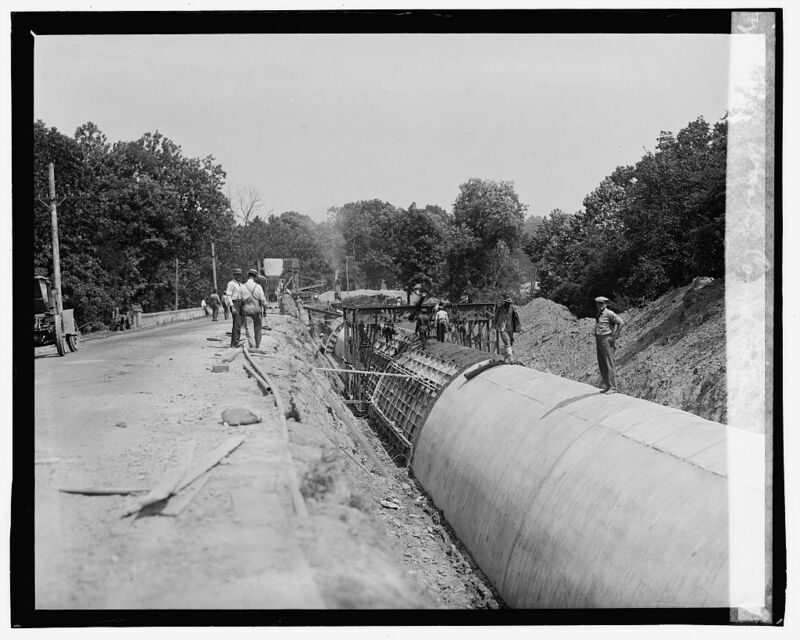 A road was built parallel to the conduit to facilitate cleaning repairs and inspections. The road was originally named Conduit Road, today it is MacArthur Boulevard. 1920s | Reference | Original1 | Original2Route of the Washington Aqueduct conduit. The Washington Aqueduct | YouTubeThis short documentary talks about only 1 conduit used at a time. We only see the conduit down as far as Georgetown Reservoir. Cities of the Underworld – Washington DC: Seat of Power | YouTubeThis documentary give a good insight into the what the tunnels look like under DC. 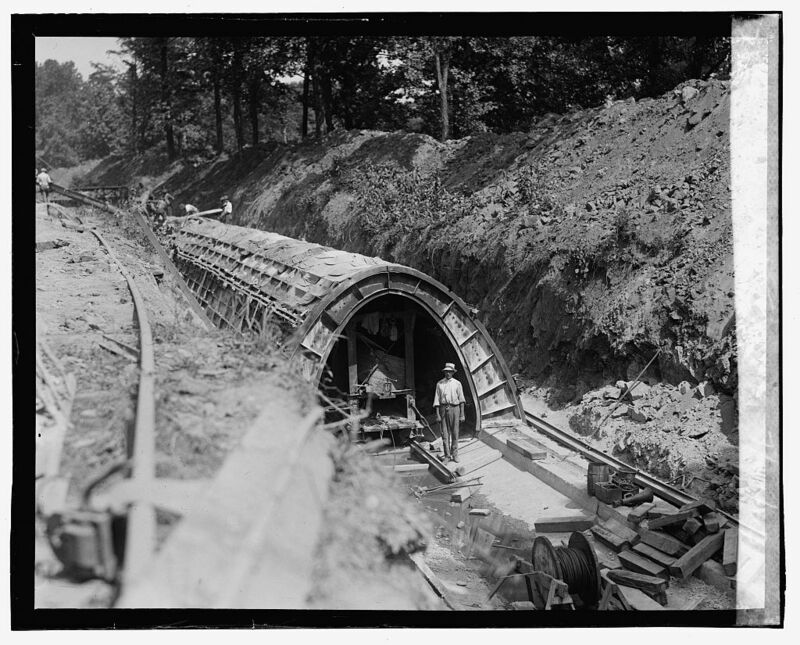 The Washington (Lydecker) Tunnel, completed in 1901 by the Army Corps of Engineers, is up to 10 meters in diameter and runs 4 miles from Georgetown Reservoir to McMillain Reservoir. Shortly after in 1926 a second tunnel was dug beside it. Within a decade the District’s population had increased by 75% and it was clear that a larger system was necessary. In 1882 Major Garret Lydecker started building a 4 mile long tunnel connecting the new McMillan Reservoir (east) with the existing Georgetown Reservoir (west). The project was marred in corruption. Eventually Lydecker received a court-martialed for his role in the fiasco and was banished to the Rocky Mountains. This map shows the proposed route of the Washington Tunnel. 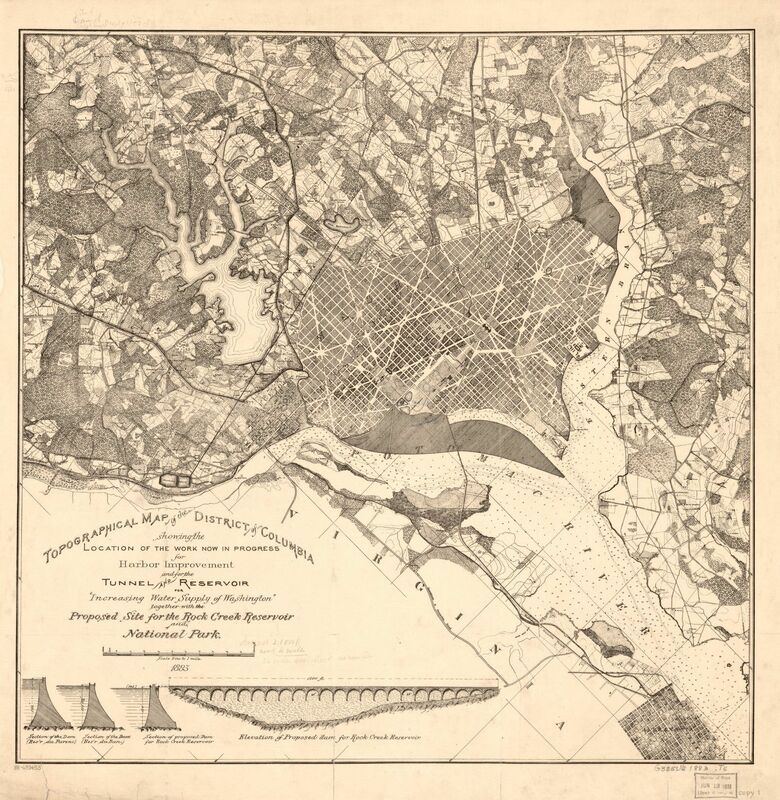 1883 | Reference | OriginalThis map shows the water distribution network for Washington DC. The Washington Tunnel is the red broken line running left across the map from McMillan Reservoir. The old Washington Aqueduct conduit is also shown in solid red lines. The Army Corps added the McMillan Park Reservoir and the Washington City Tunnel (10 meters in diameter and 4 miles long) between 1882 and 1902. 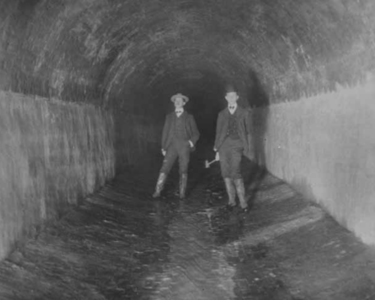 A second tunnel paralleling the original was completed in 1926 which allowed the Lydecker Tunnel to be periodically closed for routine maintenance without noticeably interrupting water service. Configuration of the Bedrock Surface of the District of Columbia and Vicinity | usgs.govThe diagram below shows a cross section of the tunnel. There are several vertical air shafts. In the Widows Mite air shaft just north of Wyoming Avenue, near the line of Twenty-second Street, the official section shows a capping of “clay and sand 30 feet thick” underlain by 35 feet of “clay,” but this is undoubtedly a mistake, as the gneiss has been revealed by many cellars in this vicinity under only a few feet of terrace gravel and sand. In the air shaft on the highest part of the ridge near the corner of Sand Thirty-fifth Streets the blueprint of the tunnel section shows 42 feet of “clay” lying on “soft rock” at a depth of 158.7 feet, but in fact the rotted bedrock out-cropping extensively in that area is overlain by very thin remnants of terrace gravel at 195 feet above sea level. Probably the clay referred to is mostly rctten rock. Merging the two maps produced this. These are approximated positions based on the maps. Harrison G. Dyar (Mole Man) 1900 – 1916I’ve included Harrison Dyar to show some example of the tunnels in central Washingtpn DC. This is a tunnel we know about on P Street, NW. This tunnel is highlighted in green on the map above. So do the tunnels themselves, which fan out as far as 200 feet behind his old Dupont Circle home, though they’re now sealed with concrete. I conclude from my research there are many tunnels under Washington DC. The ones outlined above are ones we know about. Some are as old as 1850s. As demand for water increased they built new tunnels and laid new pipes. The older tunnels being left to decay. Interestingly here are 4 properties that sit directly on top of the old aqueduct tunnels. 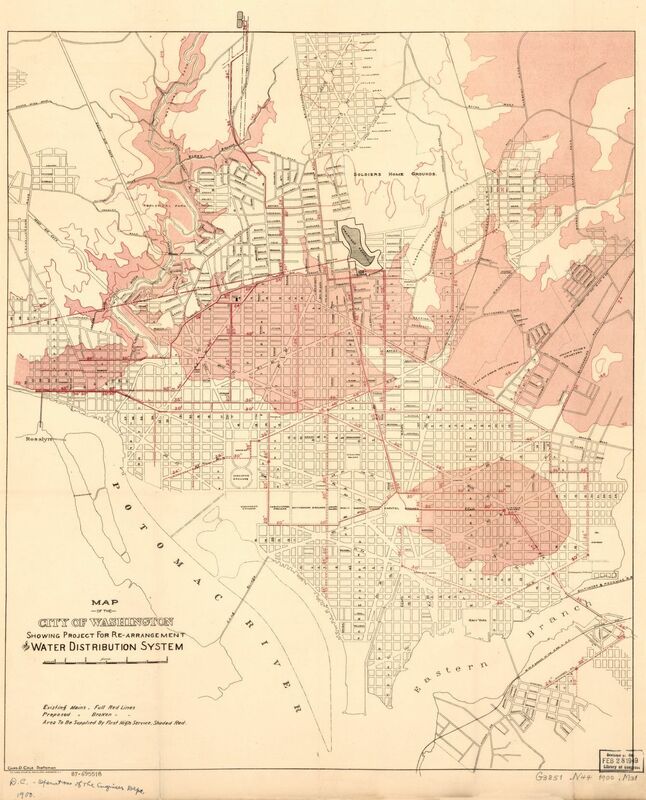 Most of the properties in Washington sit above some form of a tunnel or another but it seemed quite a coincidence that the only map I could find of the aqueduct system of tunnels was from 1900s and Alefanis etc have properties either very close or right on top of them. The articles point out the tunnels aren’t that far from the surface so digging down from any building wouldn’t be a great challenge. You would just need to know where to dig.